collaboration, participation, task sharing, and reciprocity in public problem solving, and an equality of respect for the knowledge and experience that everyone contributes to education, knowledgegeneration, and community building. This book shrewdly rethinks the culture of higher education.John Saltmarsh is the Director of the New England Resource Center for Higher Education (NERCHE) at the University of Massachusetts, Boston, as well as a faculty member in the Higher Education Administration Doctoral Program in the Department of Leadership in Education in the College of Education and HumanDevelopment. 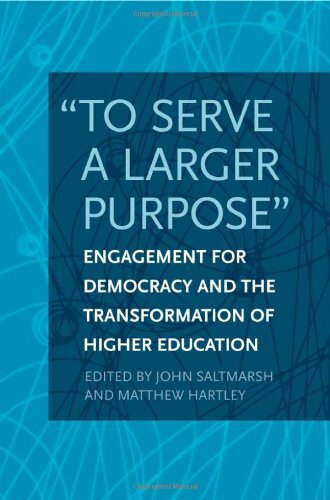 He is the coeditor (with Edward Zlotkowski) ofHigher Education and Democracy: Essays on Service-Learning and Civic Engagement(Temple).Matthew Hartley is Associate Professor and Chair of Higher Education Division at the Graduate School of Education at the University of Pennsylvania. Introduction "To Serve a Larger Purpose"
Civic Engagement on the Ropes?